The Brises del Mar is a small apartment building situated in the centre of Estartit less than 100 metres of the beach. The complex comprises a selection of 2 holiday apartment rentals. All with air-conditioning. The Brises del Mar comprises a small block of 12 apartments with its own communal swimming pool. Lovely ground floor holiday apartment located at the Brises del Mar complex in Estartit. This modern apartment has a large furnished patio and sleeps up to 4 guests. It has a well furnished living/dining room with TV, well equipped kitchen including dishwasher and washing. 2 bedrooms (1 double and 1 twin) and a bathroom. It has air conditioning, Wifi, BBQ and a private parking space. 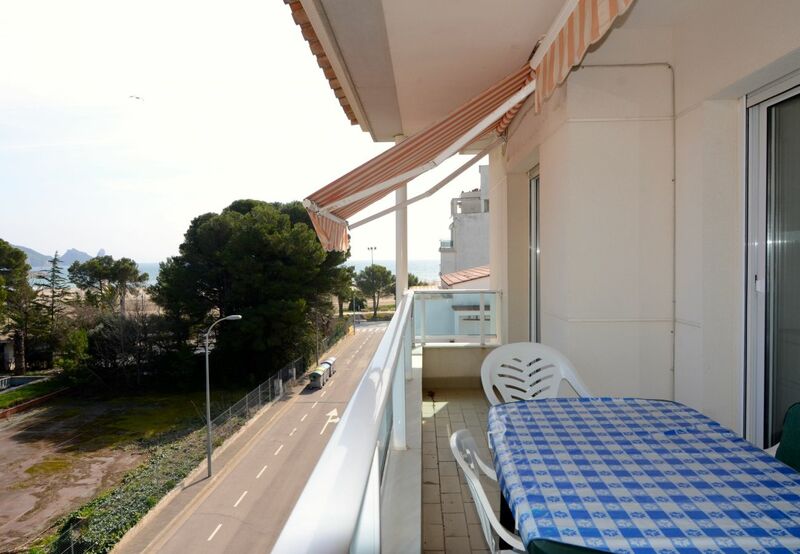 This third floor holiday apartment is situated at the Brises del Mar complex in L'Estartit. The apartment has 1 double bedroom and 1 twin bedroom. 1 full bathroom, Fitted kitchen including dishwasher and washing machine. The lounge has TV and doors to the terrace with a side view towards the sea. The apartment has air-conditioning and parking is available. This 2nd floor apartment for rent is located at the Brises del Mar complex in Estartit. This apartment has a furnished terrace and sleeps up to 5 guests. Living/dining room with double sofa bed and TV, well equipped kitchen including dishwasher and washing. 2 bedrooms (1 double and 1 twin) and a bathroom. It has air conditioning and parking. Ground floor vacation apartment rental located at the Brises del Mar complex with communal swimming pool in Estartit. This apartment has a terrace and sleeps up to 4 adults and room for 2 extra children on the double sofa bed in the lounge. It has furnished living/dining room with TV, equipped kitchen including dishwasher and washing machine. 2 bedrooms (1 double and 1 twin) and a bathroom. It has air conditioning, Wifi available and off road parking space. A small block of well appointed apartments, situated in the centre of Estartit and only 50 metres from the beach. This ground floor apartment with terrace has off street parking, air conditioning, TV, washing machine and dishwasher. It consists of 2 bedrooms, one with double bed and the other with 2 single beds. A sofa bed available in the lounge. The building is located just 100 metres from the beach. This south facing apartment is on the first floor and benefits from air-conditioning. It has 2 bedrooms (1 double and 1 twin), kitchen equipped with oven, hob, dishwasher, fridge freezer, washing machine and dryer. The lounge has TV. Brises del Mar also has private parking. Equipped with balcony and off street parking, air conditioning, TV, washing machine and dishwasher. 2 bedrooms, one with double bed and the other with 2 single beds. A sofa bed available in the lounge for 2 children. Small block of only 16 well appointed apartments with use of a communal swimming pool and gardens, situated in the centre of Estartit and only 50 metres from the beach. 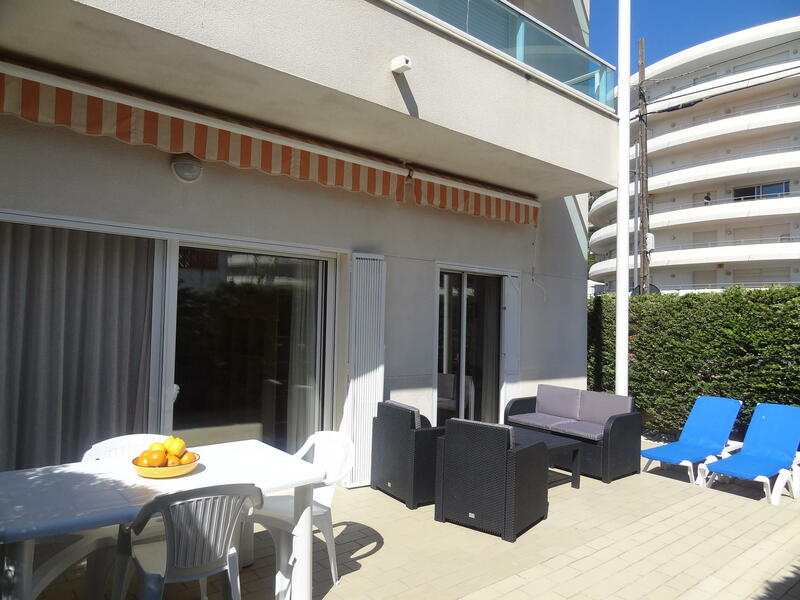 3rd floor holiday apartment to rent located at the Brises del Mar complex in Estartit. This apartment has a furnished terrace and sleeps up to 6 guests. Living/dining room with double sofa bed and TV, well equipped kitchen including dishwasher and washing. 2 bedrooms (1 double and 1 twin) and a bathroom. It has air conditioning, parking and wifi on request. This ground floor holiday apartment is situated at the Brises del Mar complex in Estartit. This small development of just 12 apartments share a communal swimming pool and enclosed gardens. The apartment has air conditioning, equipped kitchen, lounge with TV, 2 bedrooms, 1 bathroom, parking and communal swimming pool.